I’ve been a Star Trek fan ever since I was ten or twelve or thereabouts–whenever it was my dad first showed me “The Empath.” Since then, I watched every episode of Classic Trek, and sizable chunks of…almost everything else, even the animated series. But until recently, there was a gaping hole in my Star Trek experience. I had never watched Voyager. I’d seen maybe a dozen episodes and could identify every major character, but compared to the other series I felt decidedly unacquainted with Voyager. Happily, Netflix streams every series of Star Trek, so a year or so ago I set out to fill in this gap. 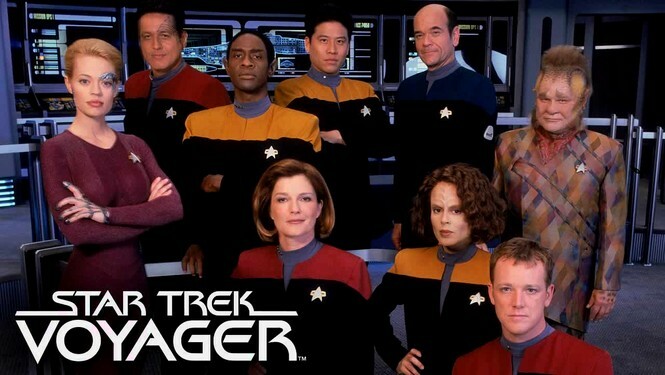 Voyager covers the adventures of the crew of the starship Voyager under Captain Janeway, lost in the Delta Quadrant with a 70 year journey ahead of them to get home. I watched the last episode a week ago. Here at the end of the journey, I think it was a decent show, but the weak link of the franchise. Mostly, I struggled with the characters. I know people who say they love this crew, and I liked them well enough by the end–but I had a lot of trouble connecting. I think the crew here may have suffered from Star Trek’s concept of a more evolved humanity. They’ve evolved into nobility, diplomacy and an appalling degree of blandness as a result. Janeway in particular suffered from a lack of a confidante. No one in the entire crew called her by first name; Kirk had McCoy, Picard had Beverly, Sisko had Dax (and a son and a girlfriend), but Janeway even calls herself “Captain” on a couple occasions when she meets a duplicate (it’s complicated…) And finally, the show suffered from an effort to keep every episode self-contained. I don’t know how many times a character experienced a traumatic or enlightening event…which was utterly forgotten by the next episode. So! I don’t actually mean to just rag on Voyager here. Overall I enjoyed watching the show, I’m glad I did, and there were some particularly good episodes I’m glad to have seen–so rather than grumbling, I’m going to highlight the particular episodes I did like. “Learning Curve” – This is one of the few episodes that really tackles the problem of integrating rebel Maquis with the Starfleet crew (something I thought was smoothed out way too fast). Three Maquis are not living up to Starfleet standards, and Tuvok is taxed with getting them up to snuff. In the midst of this very evolved humanity, I liked seeing some struggles. “Tuvix” – Due to a transporter accident, Tuvok and Neelix are combined into a new person, calling himself Tuvix and taking on qualities of both. A ridiculous concept, yes–but they go somewhere really interesting with it, as the crew mourns their lost friends, tries to adjust to Tuvix…and find themselves liking this new person too. Ultimately, Janeway is confronted with an impossible moral choice, and I respect the show for not giving her an out. A silly-sounding plot ended up with one of the darker scenes and decisions of the show. “Before and After” – An elderly Kes finds herself traveling backwards in time through her life, with no memory of the past. Since she starts several years in the “future” by the show’s chronology, we get glimpses of an alternate future that, in some ways, I liked better than how the show actually played out. I especially liked the multigenerational aspect; Kes’ species only lives 9 years, so 6 years was enough for a couple generations, and it explores in a compressed timeline what it could have been like if Voyager had really taken decades to get home. “Year of Hell,” Parts 1 and 2 – Voyager encounters aliens who are manipulating time, constantly changing the past to try to restore their empire. Voyager suffers catastrophic losses, spending months trying to get through their territory. It may be odd that this is a favorite, because I generally hate shows that conveniently “unhappen” everything at the end. But in this case, it was built into the plot all along, not a deus ex machina solution, and the writers used that to explore character growth that would have otherwise been impossible. We get to see how Janeway handles it when things really unravel around her, to an extent that wouldn’t be possible for the continued life of the show. “Blink of an Eye” – Voyager is trapped in orbit of a planet where time passes thousands of times faster than it does everywhere else in the galaxy. In a few days for the crew, centuries pass on the planet and its inhabitants advance from nomadic tribesmen to, well, Star Trek-level technology. I love the way this show lets us see the entire evolution of civilization in a compressed time period–and explore how the presence of the “skyship” alters that civilization’s growth. I loved Voyager the show and the crew like a family, since I did most of my Voyager-watching during a lonely time in my life. Actually, Voyager was the very first Star Trek series that I watched a significant amount of! I do think it suffered too often from poor writing. The self-contained episodes, the character arriving at a point of enlightenment only to be forgotten the next week was a real weakness. (I swear some characters had the exact same point of enlightenment multiple times.) The integration of the Maquis was way too easy… I mean that could have been a great plot line to drag out. Some of the characters were just plain boring. I wasn’t too happy with the ending. Sometimes I get sad about how much potential Voyager had. I still love it, though. Year of Hell and Blink of an Eye definitely make my top ten list, too! I’d add “the one where Tuvok bakes a cake,” “the one where Tuvok mind melds with a killer,” “the one where everyone think’s Tuvok’s training program is a fun holonovel until it turns ugly,” and “the one where Neelix tells a scary story to the Borg kids,” to my list. I just… embrace the madness. If you want some good Voyager books to read now that you’ve seen the series, I suggest Pathways and Mosaic by Jeri Taylor. She was actually a producer and main writer for the show, and these books dig into the lives and pasts of the Voyager crew, so they’re sort of semi-official. These are her characters. Mosaic tells Janeway’s story, and Pathways tells everyone else’s. Been a while since I’ve read either, though, so my estimation of the books could be warped with time. I watched nearly every episode of Voyager while it was on the air, so I am a huge fan. I had watched the last few seasons of Next Gen as a kid, and I was SO excited that there was going to be a female captain. The fact that Janeway is a woman AND that this is unremarkable on the show was and is a big deal to me. I also like that she’s not defined by romantic attachment, though I do think that her relationship with Chakotay evolves from being enemies to coexisting to almost-romantic to very close friends. So, I would classify him as her confidante even if they didn’t know each other before the voyage. And i do think there’s a ;lot of character growth over the course of Voyager, with Tom, B’Elanna, and the Doctor in particular. That said, DS9 is definitely more focused on character growth and there is an overarching plot that is unlike TOS, Next Gen, or Voyager. Like Carl I also watched this when it first aired. My dad, bless him, recorded every episode so we could watch them when I came to stay. I watched it from 7 till I was 13 years old. For this reason I will always have fond memories of this show and feel the biggest connection with it, as it was sort of my generation of Star Trek. I hope you enjoy Deep Space Nine. At the time it was shown it didn’t do it for me. Being a space station they didn’t go anywhere … perhaps as an adult I would appreciate it more. The Year of Hell episodes are definitely phenomenal! And Deep Space Nine! I have so much love for the character/story arcs in it! Can’t wait to see what you think of it! Voyager was okay, but definitely the least strong of the five series. I recall one episode in which Janeway was talking about Kirk, who to her was a historical figure. She commented that Kirk’s crew was “slower to invoke the Prime Directive” and “quicker to draw their phasers.” Very true–which is precisely why the original series was a far more exciting show! I watched this one when it was on the air, and although I doubt I caught every episode, I caught the majority. I remember really liking the show, but I don’t know how much of that was the fact that I had largely ignored Next Generation (until the last three seasons), thought Deep Space Nine sounded boring, and was just aching to experience the show with other fans. It is telling that I’ve had no desire to go revisit it, while I am slowly but surely watching all of Next Generation with my wife and a few years back we devoured all of Deep Space Nine and loved it with a passion that is nearly as strong as the attachment I made in childhood to the original series.